Students at the Long Beach Public Schools’ Lido Elementary School are helping to promote recycling around the community through the “Adopt-a-Bin” program, presented by Leah Tozer and Amanda Moore of the Long Beach Chamber of Commerce Board. 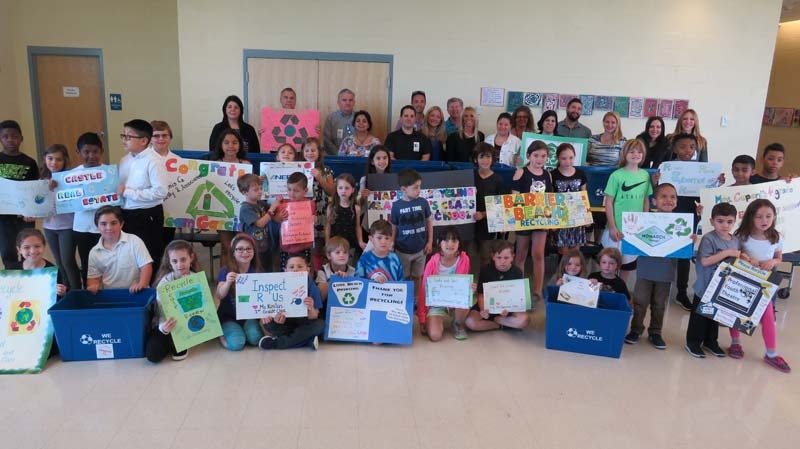 Classes sponsored local businesses and presented them with recycling bins during a gathering held on May 21. Students and staff members generously provided donations to cover the $20 cost of each recycle bin. They also created signs for the businesses to encourage recycling and will monitor their efforts through follow-up visits. This initiative was coordinated with the objective of engaging the entire business community in practices that reduce litter and improve the environment. Among the participating businesses are Bethpage Credit Union, Blacksmith’s Bread, Beach Baby Day Care, Tutti Frutti, Edward Jones Financial Advisor Kelly Sullivan, Engel & Volkers Real Estate, Long Beach Printing, Youth Theatre, NEFCU, Inspect R Us, Island Park Car Wash, Body & Soul, Barrier Beach Management, Creative Vibe, KoKo Fit Club, GWM Architect, P.C., Castle Real Estate, Denis Kelly Law Firm, Café of Life, Ooh LaLa, Cybernet and Key Food.